To this point, most experts seem to think the Chicago Bears draft plan will involve one of two moves. Either they will stay in place at #87 overall in 3rd round. Or they might try to jump up the board for a certain player they might covet. Most likely a running back of some sort. Here’s the thing though. It’s never a wise decision to try predicting what GM Ryan Pace will do. Too many times just when people think they have him figured out, he does the unexpected. While aggressiveness has often been his choice of action in the draft, he’s had certain situations where a move down was better for the team. That could be the case this year, and there’s plenty of incentive to the idea. People continue to assume that the Bears will actually consider trading up in the draft if Pace happens to hone in on a prospect he likes. However, that could prove difficult with only five picks in the entire draft. This means he’d either have to deplete that inventory further or go dipping into his future picks in 2020. Something he probably wouldn’t prefer to do. On the other hand, trading down offers an opportunity to stockpile an extra pick or two in the later rounds. It may sound counterintuitive but there is some merit to the idea. Here are what some teams secured when they chose to move down in the same area of the draft the Bears will start in two weeks. Depending on the situation, the Bears could end up getting a nice return in exchange for moving down. It all depends on the player available and the how badly the team interested wants him. Pace has pulled off this sort of thing before. Don’t forget he scored two 4th round picks from Buffalo to move down just eight spots in the 2nd round back in 2016. One of those picks was used to trade up for Eddie Jackson a year later. 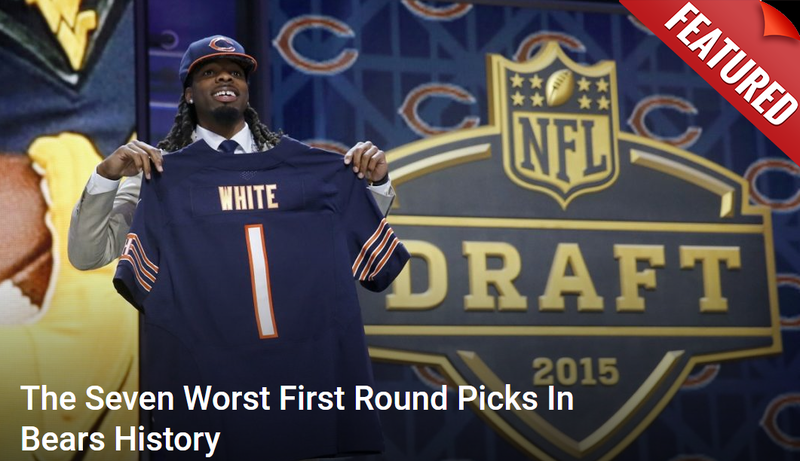 Then there is the fact that the Bears GM has proven his mettle late in the draft. Among his many scores in the 4th and 5th rounds include Adrian Amos, Jordan Howard, Jackson, Tarik Cohen, and Bilal Nichols. Say instead of having a 3rd, 4th, and 5th rounders he turned it into two 4ths and two 5ths? Given his track record, one could feel reasonably confident that Pace would find a couple productive players in that situation. Plus they’d end up with six picks overall instead of five, getting one extra to help fill out that depth chart. It all comes down to how the board sets up for them when the clock starts ticking late on Day 2.